I love giving and receiving personalized or custom made gifts! If your looking for something with a personal touch on it for Valentine’s Day Zazzle has LOTS of great options. I had the opportunity to choose a couple of items from Zazzle for review. There were so many different items to choose from and certainly something for everyone. T-shirts, mugs, stickers, bags and even postage for an added touch to a Valentine’s Day card. All of which was easy to find and navigate my way through the site to find exactly what I wanted. Since I bought Daddy Digger an iPad for Christmas I thought it would be a great time to finally get him a case for it. I spent at least a couple of hours looking at all the options that Zazzle offers. There is a case for whatever your taste may be. Funny, Floral, Artistic, Patterns, Scenic, Animal print and many many more iPad Case styles (too many to list here, thats for sure!) even if you don’t find what you want you can even make your own with personal photos or design it yourself. I finally decided on the Fortestique Speck iPad Case. I love that it looks like a briefcase and since Daddy Digger brings his iPad to the office with him I thought it was perfect! I had his initials put onto it so it has a nice personal touch as well. The case is very sturdy and has a front and back to it so your iPad is fully encased, the briefcase design also has a cool fabric texture to it. The case is made by Speck who is well known for making great iPad and iPhone cases. 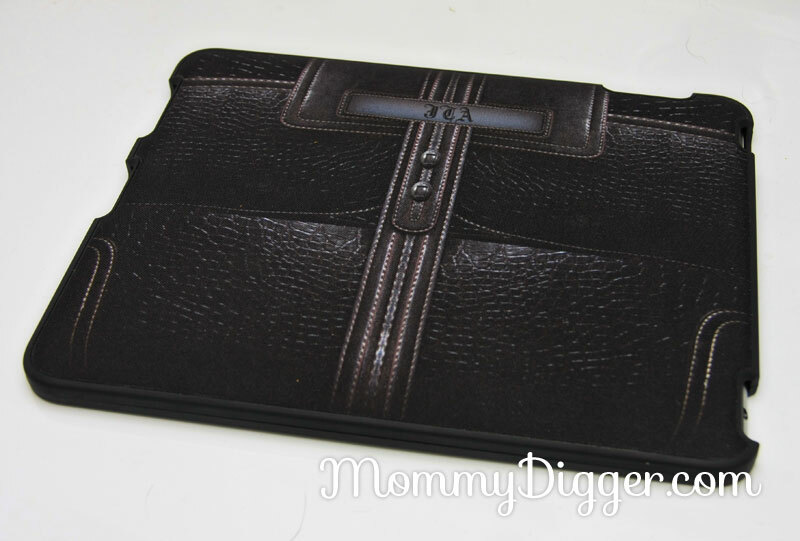 Daddy Digger loves the look of his iPad case from Zazzle! I love photo mugs and am always thrilled when I receive one and as a mom it is the perfect gifts for aunts, uncles and grandparents. Zazzle offers many different mug options that you can customize and personalize the way you want it. I chose a simple white mug and put one of my favorite pictures of Baby Digger so that I can always see her sweet face on my desk. The mug is nice quality and the photo is printed onto it very nicely. A photo mug is perfect for any occasion and I would certainly recommend checking out all the options Zazzle has to offer. I am very happy with the items from Zazzle and will definitly be a returning shopper. The prices are great, the products are high quality and the printing done on the photo items is very nice and true to the photos that you upload. I love that they offer so many different things that you can put your own personal touch on! I received a iPad Case and Mug from Zazzle for the purpose of this honest review. All thoughts and opinions are my own. This post was written by me and not edited by anyone. I’ve heard of Zazzle before in creating personalized t-shirts, but didn’t know the extent of what you can personalize. I need a case for my iPad 2, but I’ve never seen any that really interest me and from what you’ve said, I guess I’ll have to check out their website. That briefcase-style cover is really attractive! Thanks for the post. this looks like a great company; i love gifts likethese! i’d love mug w/ my children’s photo. 🙂 thanks for the review. I love the Zazzle iPad case. Thanks for the review. I love personalized picture mugs and such!!!! I will remember this company when I go to buy these next time! Sounds great! I think a mug may be a fathers day gift this year! Maybe have it say “Daddy’s Girls” and put a couple pics of our little cuties on it. Good idea! lol. Thank you!